Perhaps the only thing harder than struggling with an illness is a diagnosis of an illness that doesn't garner popular support. When your disease lacks a brightly-colored ribbon and large-scale athletic support events to fund research, the loneliness and singularity of your situation appears evermore stark. The lack of widespread awareness makes it challenging to find others struggling with your condition, only serving to intensify the isolation that comes as a result of the day-to-day managing of symptoms of that illness. Mesothelioma is one such illness. Mesothelioma is a disease that comes from asbestos, a building material and dangerous human carcinogen. It affects not only those who work with building materials, but also veterans and their families who've acquired the disease through secondhand exposure. In honor of Asbestos Awareness Week, April 1st through 7th, MilitaryByOwner would like to help raise awareness by sharing facts about mesothelioma and asbestos, as well as ways that you as a military homeowner and military homebuyer can learn how to protect your families against asbestos. 3,000 people a year are diagnosed with mesothelioma. Those diagnosed are typically given less than a year to live. Mesothelioma results from the inhalation of asbestos. Sustained inhalation damages the mesothelium, the outer tissue of the lung cavity. It may take decades for the disease to materialize, though WebMD notes that lung cancer and asbestosis may occur first, 15 years after initial exposure. Asbestos has been used since ancient times as insulation and fire retardant building materials. Any level of exposure to asbestos is unsafe. 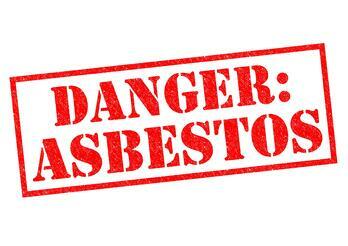 Asbestos is not illegal and remains widely used in consumer products. Homes, particularly older homes, commonly contain asbestos material. The material can be found in everything from tiles to siding and plaster. You can also find it in pipe wrapping and popcorn ceilings. The EPA estimates that 30 million US homes have asbestos material in them. Navy ships and shipyards are rife with asbestos, putting Navy veterans and those who served aboard ships at a high risk of exposure. Veterans who were exposed to asbestos may be eligible for service-connected compensation benefits. You can learn more about the eligibility and evidence requirements on the Veteran’s Administration’s Asbestos Exposure page. Exposure alone is not sufficient for compensation. Family members have acquired the disease when laundering the clothing of those who worked with the material. Your child may be at risk in school: The EPA estimates that 107,000 US schools have asbestos materials. Fortunately, unless the material is damaged in some way, then asbestos does not pose an immediate health danger. Stop smoking or avoid exposure to secondhand smoke; you don’t want to compromise your lungs any further. Request a Mesothelioma blood test from your PCM or regular doctor. You should have this test conducted annually. Request an annual x-ray of your lungs to check for how effectively they are working. If caught early, treatment options provide a much lower risk of mortality from the disease. Help raise awareness of the risks of asbestos to fellow military families and those who may have been exposed to asbestos. You can engage in awareness of mesothelioma and help saves lives by using the hashtag #AsbestosAwarenessWeek in social media. MilitaryByOwner thanks Heather Von St. James, a mesothelioma survivor, for sharing this information with us and making us aware of Asbestos Awareness Week.